On April 7, 2012, the eighteenth anniversary of the Rwandan genocide, the Chairperson of the African Union, Dr. Jean Ping, addressed a solemn gathering of African Union delegates. Commemoration, he stated, “is directed at ensuring that, as we construct visions for the future, we should be mindful of the past experiences and in particular, we should ensure that the future we are seeking to build does not accept the re-occurrence of experiences like genocide.” He also acknowledged the senseless violence that millions of Africans across the continent have suffered in blatant disregard for principles of human rights. Speaking from the new African Union headquarters, opened in January 2012, Dr. Ping was standing on the very location of massive past human rights abuses. To make way for the new building, an old structure, the former Alem Bekagn prison was demolished. In Alem Bekagn, generations of Ethiopian political prisoners suffered arbitrary detention, torture, and summary execution. At no time was the fate of prisoners more dark than during the years of the Red Terror. The symbolism of this location for the institution dedicated to fostering peace, security, and prosperity in Africa—an institution born in the wake of two crucial events in 1994, the genocide in Rwanda and the ending of apartheid in South Africa, on a continent that has suffered too frequently from civil war and the long history of brutal international attention guided by racism and the practice of slavery—was not lost to the African Union’s leaders. And so, on the grounds of the new African Union building a permanent reminder and beacon will be established: the African Union Human Rights Memorial (AUHRM). 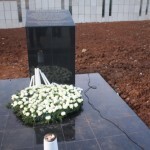 The memorial will be, as Ping stated, “an affirmation of the resolve to respect the dignity of humankind, and a commitment to prevent future recurrence of such acts.” On January 28, 2012, a memorial stone was laid as the first step in creating the permanent memorial. The process of creating such a memorial will take time and will solicit the testimony, insights, and aspirations of civil society groups across the continent. In support of this project, the World Peace Foundation has initiated a blog series dedicated to the issues of memorialization and human rights in Africa. We will also continue to provide updates about the progress of the AUHRM.